What do you do when you realise you’re not living out what you say you value? My friend Sarah wrote a great post last week called “When the exceptions to your routines become the rule” and I’ve been thinking about it ever since. It’s well worth a read! Her key point is that our lives can change and without realising it we find there is a disconnect between our ideas about the way we routinely live and the reality. And it has challenged me to consider where this might be true in my own life. More significantly, I like to think of myself as a person who responds to communication from others promptly. I value good communication highly and try to work towards “inbox zero”. But between juggling four email addresses, text messages, and Facebook messages, I have to admit that things fall through the cracks sometimes. The reality is that I am not always as on top of my communications as I would like to think I am. And this means that other people probably don’t see me the same way I see myself. Apparently my brother-in-law believes emails should responded to within the day. If that is the expectation then I fail it regularly, particularly when it’s a reply that will take more than a minute or two. And when I mentioned this whole issue to one of my closest friends this week, she said, “Yes, you take ages to respond to text messages.” Ouch! But thanks for the reality check. So what do we do when we recognise that we are not meeting our own expectations? Do we adjust our expectations or our reality? Do I need to admit to myself that although I would like to be a person who is on time and replies to others in a timely manner, I’m just not? Or do I need to ask myself whether (and why) I still value promptness and then think about how I can re-establish it in my daily practices? When I slow down and think about it, I have to say that I do value promptness. Not for its own sake, but because I value the people to whom I show it. I value their time, their commitment, their engagement with me. And it’s when I lose sight of that and focus more on myself (how busy I am or how stressed I am) that I overlook the message I am sending to them by my behaviour. So perhaps this post functions as a confession. I do not live up to my own desire to be a person who demonstrates how much I value others in the way I respond to them. It also functions as an apology. Friends, I’m sorry if I have dishonoured you or undervalued your time by not responding to you as you needed me to. Please forgive me. It also functions as an attempt to make myself more accountable. I recognise that I need friends who are willing to call me out and remind me when I’m not living out what I say I value. And maybe this post can also function as a reminder to some of you, that busyness can be one of the biggest hindrances to good relationships and true community. And that it’s worth letting someone challenge you to rethink your own practices and habits so that you might be honest with yourself and make sure that you haven’t overlooked what you truly value due to a false sense of your own experience. It’s commonly accepted that US politics has been polarised for quite a while. People openly identify themselves as Republicans or Democrats; most people tend to associate with those who share their political opinions; media outlets appear to be divided along partisan lines so that people can catch up with what is going on in the world from a perspective that already aligns with their own. And so it seems that the temptation to disagree with someone simply because they belong to the other side, or to support someone simply because they belong to your side, is becoming harder and harder to avoid. 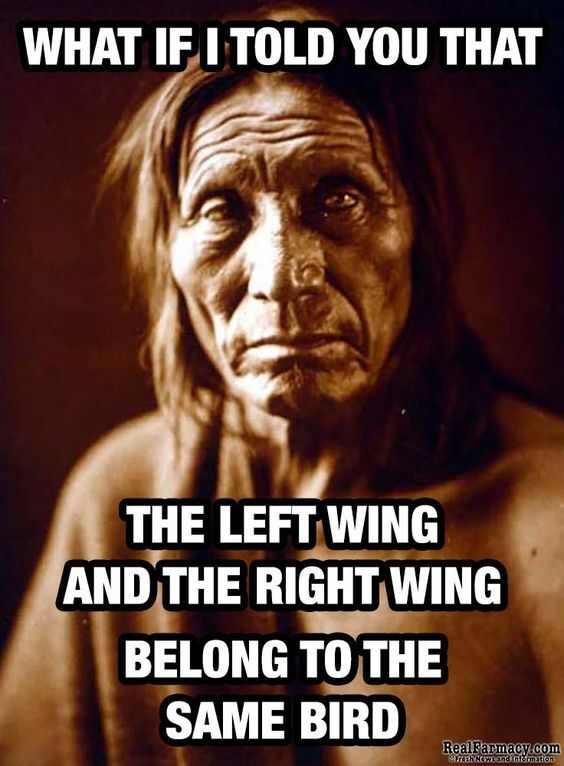 Using words like ‘left’ or ‘right’, ‘conservative’ or ‘progressive’, as the sole basis for dismissing another person’s point of view is essentially saying that you disagree with them because they are on the other side to you. That you don’t even need to listen or take into account their perspective because you have already decided that it is opposed to where you stand. That the world can be neatly divided into two opposite and opposing perspectives, one of which is completely right and one of which is completely wrong. And it’s often marked not by the language of debate, but by the language of war. The end result of this, I fear, is what we’ve been seeing more and more in the lead up to this year’s presidential election. It is particularly exemplified in the farcical (but not funny) situation where we see people attempting to defend the behaviour and views of their political party’s candidate no matter how far he strays from what they have previously stated to be their core values. It doesn’t seem to matter how terrible he acts or sounds, the fact that he is on their ‘side’ overrides everything else. From the outside looking in, it’s almost impossible to understand. Obviously there is much more I could say about the trainwreck that is Trump v Clinton, but for now I want to confine myself to this one idea and the question I have about its impact going forward from here. What will the fact that this tribalism and deep division between two sides, with little room for nuance between them, is being played out in such a public and global way mean for our future public interactions? What is the pattern being set for how civic debate is to be conducted? While here in Australia it is still quite rare for the average person to identify themselves day to day by which political party they vote for, the same kind of tribalistic language does seem to be creeping in. I’m certainly seeing words like ‘leftist’ and ‘right-wing’ increasingly used to dismiss an opinion in place of reasoned responses to coherent and valid points of discussion. And these kinds of words are almost always used in an attempt to shut the debate down. To dismiss the other point of view for the sole reason that it is perceived to be the ‘other’ point of view. It bothers me greatly and to be honest it generally makes me want to disengage. We are talking about the exchange of ideas in a free society, people putting forward their views on what they genuinely believe it best for all of us. But as soon as we start using the language of warfare and tribalism, when we put one another into two simple boxes and stop listening to those who are not in the same box as us, then it seems to me that we have all lost. How can we find ways to move beyond the simplistic categories of ‘left’ and ‘right’, ‘us’ and ‘them’? How can we recognise that good ideas can come from both sides of the political aisle, and that when we listen to one another we might even find middle ground? How can we change the tone from one of war to one of genuine engagement, accepting that we can all learn something from one another, even from those with whom we disagree, if we will really take time to listen? 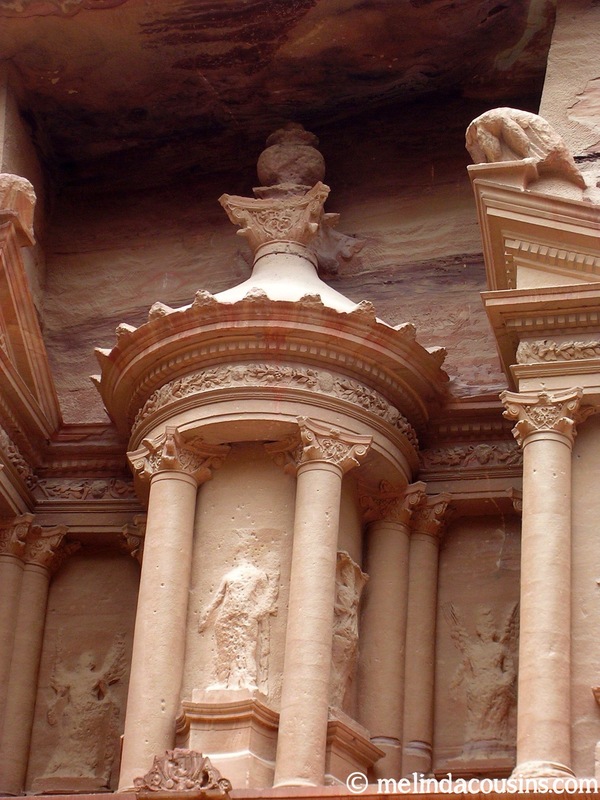 Petra makes it on to plenty of lists of places you ‘must see before you die’ and ‘wonders of the world.’ It has appeared in numerous movies and books. It certainly is a beautiful and impressive place. It is somewhere I could easily revisit as I’m sure there is much more to explore. It is an impressive looking place! But as I reflect on it today, I’m also realising that the time I’ve spent there hasn’t really left me with much of a lasting impression of what it means or who it represents. 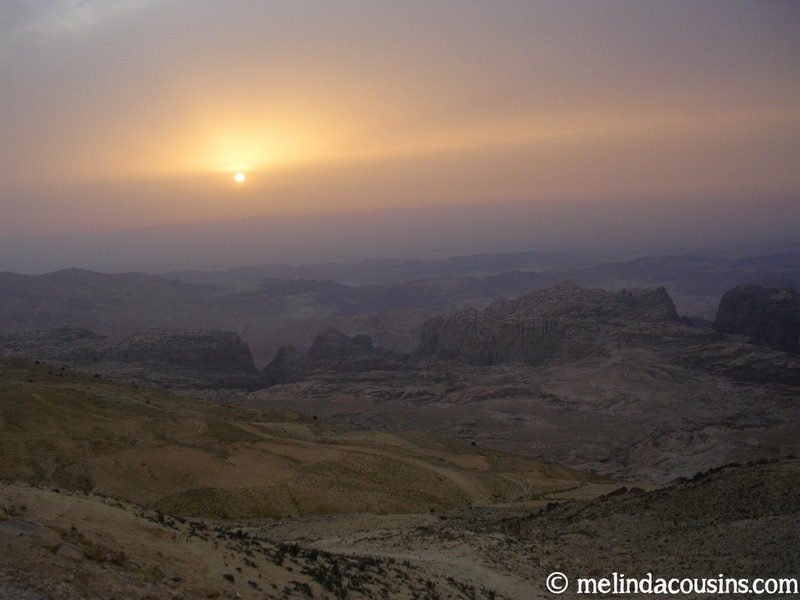 What did I love about Petra? 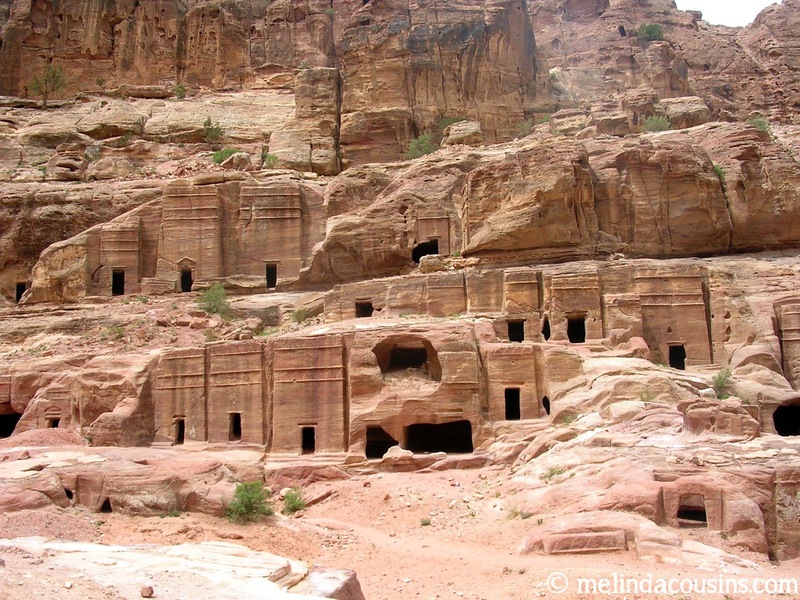 Petra was unknown to the western world until the early 1800s and its not hard to see why. 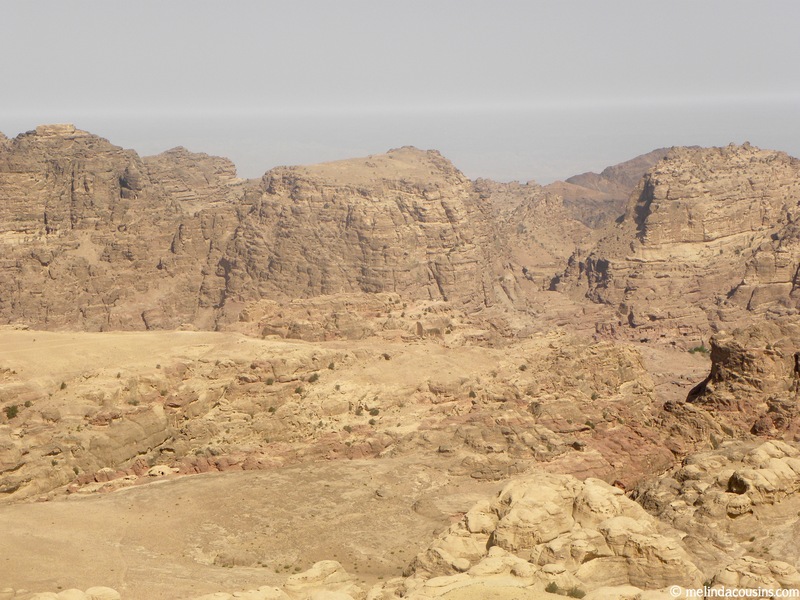 Looking out over the rugged landscape, it is difficult for those of us unused to this kind of region to imagine such a city is to be found hidden in there. 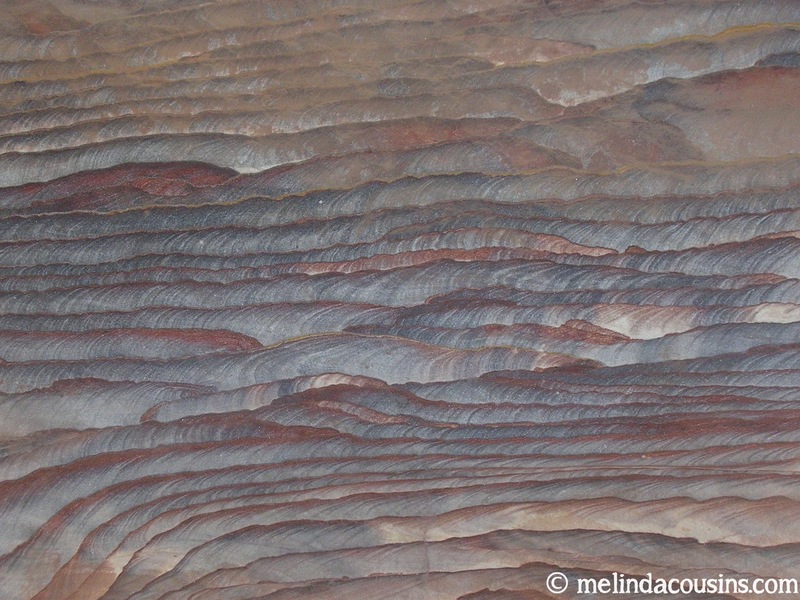 Petra is sometimes called “The Rose City” due to the colour of the rocks. They are absolutely stunning, whether from far away or close up. The entrance to the site is through a 1.2km long siq, or narrow gorge. Along it runs the remains of an ancient aqueduct, as well as some carvings such as this worn image of a camel caravan. 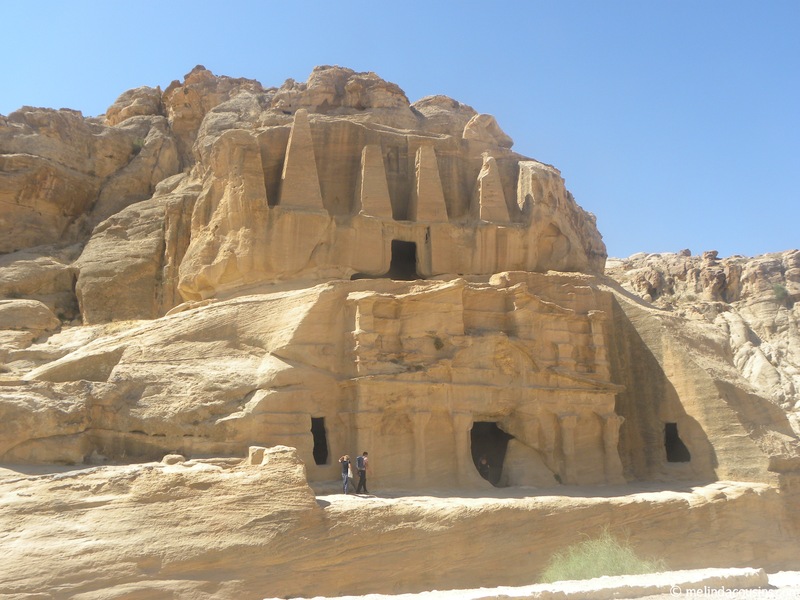 There is a moment all travellers experience of seeing the impressive Treasury building suddenly come in to view through the narrow chasm of the siq that has a “wow” factor like few other places in the world. 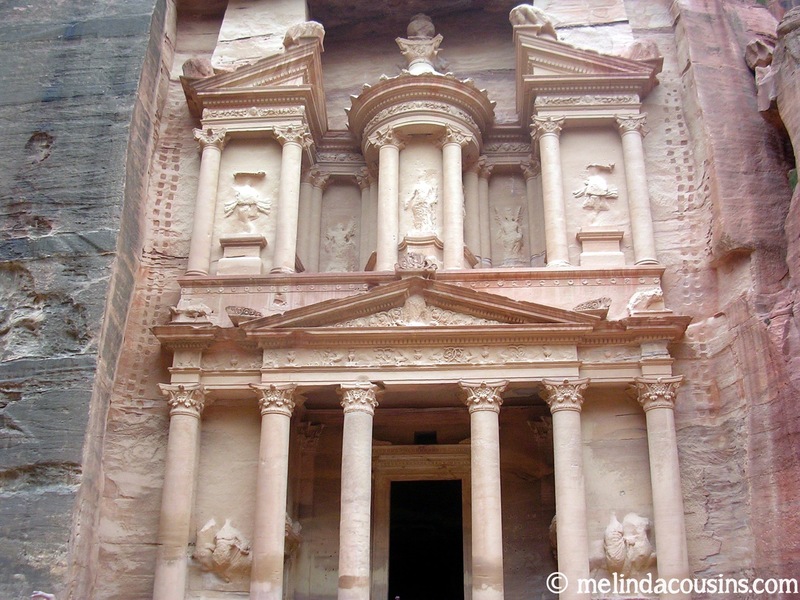 The treasury building (Al-Khazneh) is Petra’s most recognisable image and standing in front of it certainly provokes awe. Interestingly, however, it is basically a façade. There is nothing inside but an empty, uncarved room. My understanding is that rather than a storehouse for treasure as the name suggests, it was a mausoleum, a place to honour the dead. 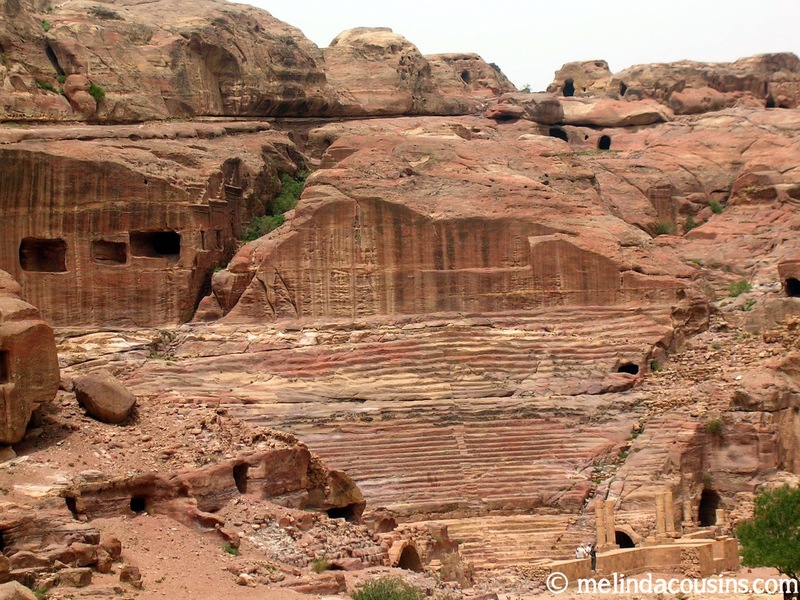 The theatre in Petra is at first glance similar to many Roman theatres I’ve seen elsewhere … until you realise that while they were built using rocks, this was carved out of the existing rocks. 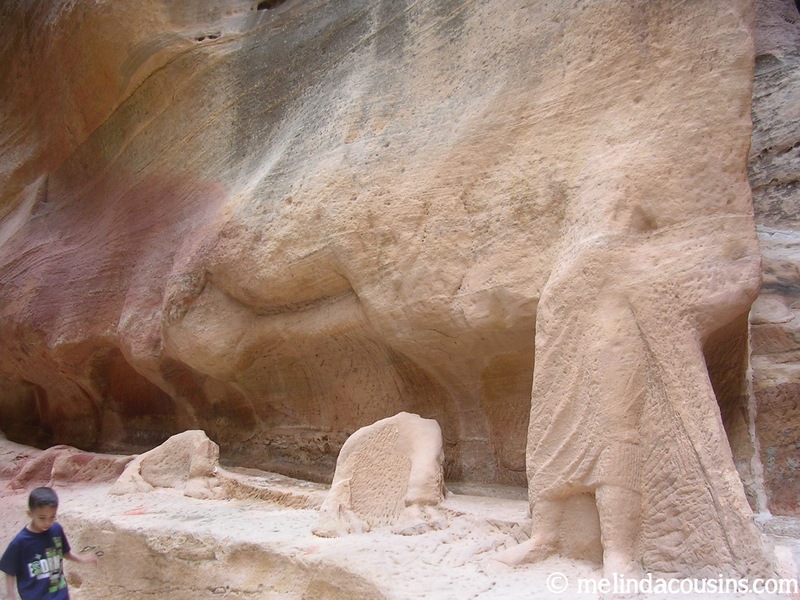 I love the idea that like Michelangelo who could see a stunning statue of David in a lump on rock, the Nabateans who built this place could imagine and then create this from the natural material already there. What did I learn from Petra? 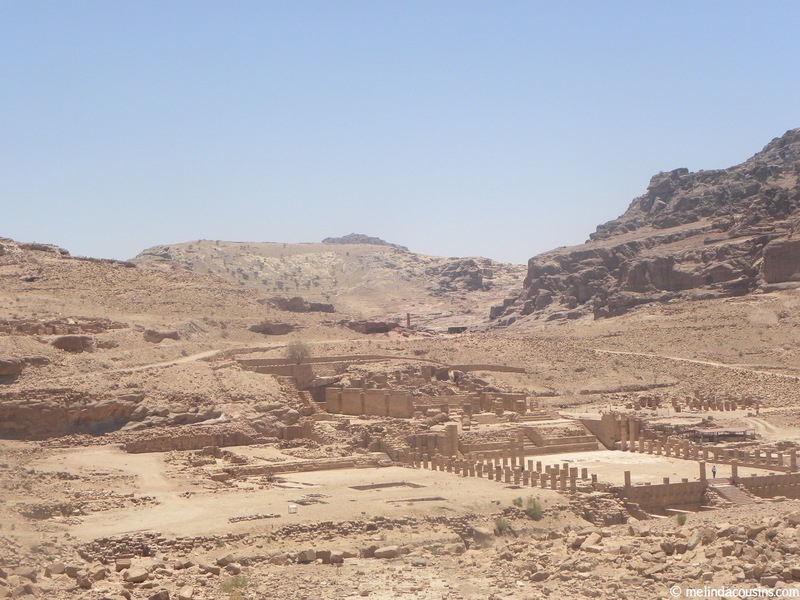 Each time I have been to Petra I have seen new things – both because I have walked into new corners of the site, and because new parts of the site have been uncovered by archaeologists. Amongst the guides I’ve had, there is some debate about whether some of the rock hewn dwellings were houses or tombs, places for the living or for the dead. Either way, the time and skill displayed by these people (without modern tools!) is impressive. 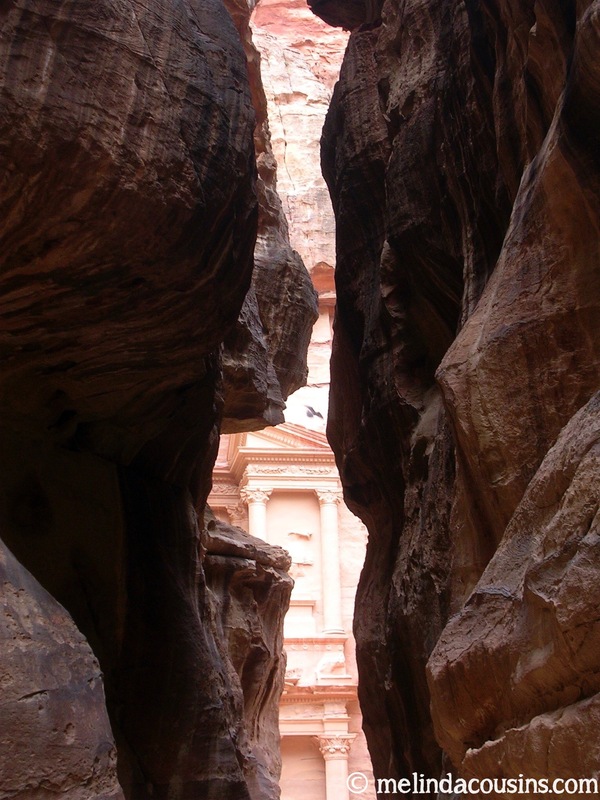 Petra was home to the Nabateans and it remains their primary legacy. Unlike the Romans, whose structures and artefacts are found all over the place, it is really the only thing they are remembered for. For me, however, it seems a somewhat confusing legacy – raising more questions than answers about who they were and what they valued and why they did what they did.